When it comes to churning out watches for the masses that are reliable and long lasting, one of the names that come to mind would be Casio of Japan. 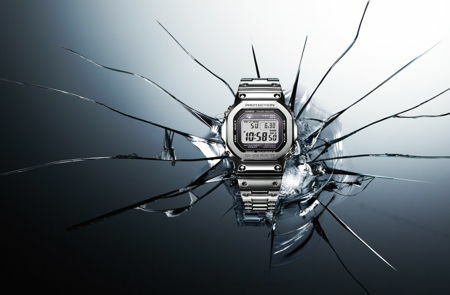 Casio has long been a bastion of quality timepieces, and their G-SHOCK range has been held in high regard for delivering accurate time-telling while being able to survive even in the most demanding of situations. 2018 is a watermark year for Casio, as the company has decided to roll out the very first all-metal men’s model in the form of the G-SHOCK DW5000. The first Full Metal 5000 collection will boast of a brand new, specially crafted all-metal timepiece that was inspired after 35 years by the original 1983 DW5000 design, which boasted of a square shaped bezel and brick pattern face. Of course, three and a half decades have passed since, enabling this upgraded 5000 series watch to bring with it a modern, lustrous, full stainless steel housing, without sacrificing on its vintage aesthetic look that pays homage to G-SHOCK’s origin. There will be a couple of featured colorways in this collection, where the GMWB5000D-1 will arrive in silver while the limited edition GMW5000TFG-9 can be had in gold. In order to keep up with the times, this latest in a series of G-SHOCK Connected timepieces will feature Bluetooth connectivity, and at the same time incorporate a super illuminator LED light and solar battery in order to ensure that it will keep on going perpetually without ever having to change batteries. With its capability to self-charging perpetually, alongside two-way time sync with G-SHOCK’s Multi-Band 6 technology, shock resistance and 200M water resistance, world time (in 39 cities + UTC), a quartet of daily alarms and one snooze, a target alarm, a 1/100th second stopwatch and countdown timer, full auto calendar and 12/24hr formats, you know that this timepiece is all that you need. All of it are crammed into a fashionably slim 43.2mm case, where the new GMWB5000D-1 and GMWB5000TFG-9 will retail for $500 and $600, respectively from the beginning of May onwards.